Council on Rural Services hosted 25 participants from New York, Michigan, Indiana, Pennsylvania and Ohio for Parents as Teachers training. 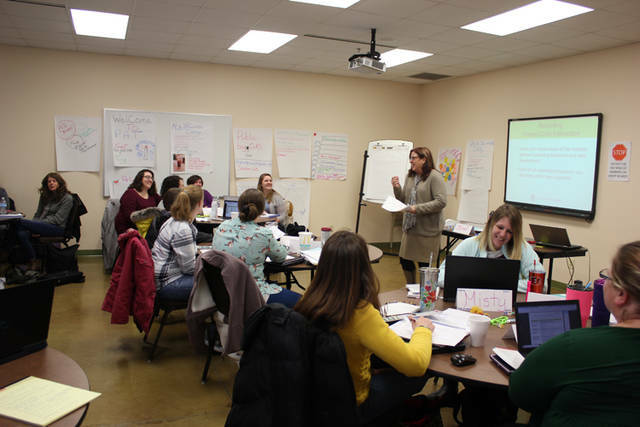 DARKE COUNTY – Council on Rural Services hosted 25 participants from New York, Michigan, Indiana, Pennsylvania and Ohio for Parents as Teachers training the week of Jan. 28. The PAT relationship-based and parenting-focuses approach to home visiting helps prepare staff to promote school readiness and parent engagement, hallmarks of Head Start and Early Head Start. CORS home visitors make regular personal home visits for prenatal through kindergarten-age children, educating parents and pregnant mothers in best practices for encouraging child development and a great start in life. Head Start and Early Head Start parents are challenged to set family and personal development goals as well with a goal toward advancing families out of poverty, drug dependence or homelessness. PAT is an internationally recognized evidence-based home visiting model backed by 35 years of research-proven outcomes for children and families and is used by other early childhood development programs such as Help Me Grow. CORS annually provides Head Start/Early Head Start services to more than 2,000 children in nine counties in West Central Ohio. In addition, CORS Gateway Youth Program assists at-risk youth in Darke County middle and high schools. The ACES classrooms in Miami and Darke counties provide an alternate path to complete a high-school diploma with the help of social services and accredited teachers in a supportive environment. For more information on CORS, visit www.councilonruralservices.org.